A photo of the Piraeus station, the last and most southern one of Metro Line 1 (green line). Using public transportation for the first time in Athens can be an adventure to say the least; the best way to learn is to get out and immerse yourself in it. Traveling on foot is a great way to get a vibe of the city and take in the sights, especially since many of the main attractions are located in central Athens. However, for travelling longer distances, the transit system in Athens can take you to the furthest areas such as Piraeus, Lavrio, and Rafina. The vibrant and populous city of Athens has made significant improvements in its transportation in recent years, particularly after hosting the 2004 Olympics. In efforts to modernize the transit system, Athens introduced the new “Athena card” in October 2017, a plastic card that has phased out the old paper tickets. Further, the implementation of the metal bars in metro has been added this year as a security feature and to deter people from riding the metro without a ticket. The options for getting around in Athens include the metro, bus/trolley, tram, and taxi. 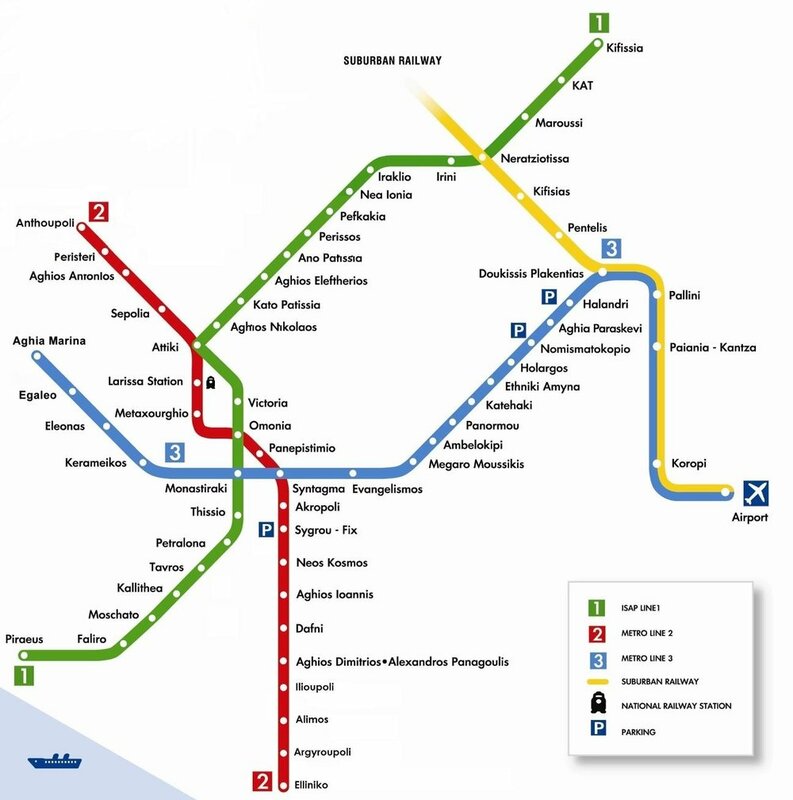 The map of the three metro lines in Athens. The metro is without a doubt the quickest and easiest way to get around Athens. Although it can be challenging to read the Metro signs that are sometimes may appear only in Greek, I was able to get a decent grasp of the Metro relatively quick. It’s quite straightforward as it comes only as three lines, making it easier to navigate compared to other cities like Paris with far more intricate systems. Syntagma station in the center of Athens doubles as a museum, housing the antiquities and other archaeological artifacts discovered during the construction of the metro. Make sure to take some time to stop and check out the artful displays before or after your commute! Line 1 (the Green line) started operation in 1869, making it the second oldest underground system in the world after the London Underground. Carrying almost 600,000 passengers daily, line 1 serves to connect the port of Piraeus and northern suburb of Kifissia in less than an hour. It’s worth noting that this line is a bit different than the other two, as it is much older, slower and not as "clean" since lines 2 and 3 opened in 2000 with increased cleanliness and security. Line 2 (the red line) runs from Anthoupoli to the southern suburb of Elliniko near the Sardonic Gulf. Line 3 (the blue line) runs from the western suburb of Agia Marina, past the center of Athens and suburb of Halandri, and then ascends up to ground level towards the airport. The trip from the Airport to Syntagma (center of Athens) lasts 38 minutes. Explore all major attractions of Athens in one day! The trains of the suburban railway transfer you to areas outside the metropolitan area of Athens up to the city of Kiato, near Corinth. 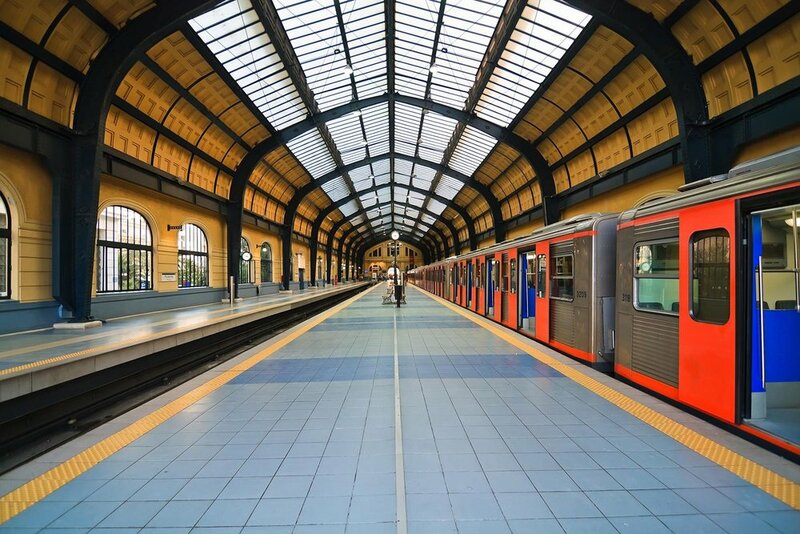 My very first experience with public transportation in Athens was the suburban railway; I remember my ride from the airport into the city as a pleasant one. The suburban railway (proastiakos) connects the Athens airport with central Athens, and also to the National Railway network. If you’re looking to take a break from the hustle and bustle of a big city like Athens, the suburban railway offers access to major archaeological sites and tourist destinations to other cities in Greece, like Corinth, where you can plan a day trip with your friends or family. Please note that there may be frequent strikes during summer 2018, and also that different fares apply. The standard 90-minute ticket for the Athens region covers all Proastiakos journeys from Piraeus to Magoula and Koropi stations, while different fares are charged for more distant stations. For more information visit the TrainOSE Website. According to a new law in 2018, you can only enter the buses from the front door. Here, a bus passing in front of the Greek parliament. I found that taking the bus in Athens is not as enjoyable of an experience as the Metro; the Athens Urban Transport Organization S.A. (OASA)'s bus network can be confusing and unpredictable at times. Even using google maps, I often had a difficult time locating the correct stop as bus stops are often hidden away on side streets. During the first week, I heavily relied on helpful locals who would point me in the right direction. The trolleys are similar to a bus but run on electricity and the signs for the stops are usually yellow. They are affordable and a 90 min ticket from the Metro can be used to connect with another bus, trolley or the tram. Lastly, the buses sometimes go on strike for several hours at a time as well. Tip: A useful app is “Moovit”, which alerts you of a strike ahead of time so you can avoid any inconvenience. The Athens tram serves mostly tourists and citizens who want to visit the southern suburbs of the city. The environmentally friendly tram connects Syntagma Square with the beach areas along the coast, including Glyfada neighborhood in the east and Piraeus in the west. There are 3 lines operating exclusively along the scenic sea-front promenade. Line 3 “Voula – SEF” - running along the coastal zone. The tram is an affordable option for unlimited one-way travel with up to 5 stopovers in 90 minutes. Within that time, you could easily stop at a local market for some fresh produce and then head to the beach for a refreshing drink by the sea. The following applies for the metro, buses, trolleybuses, and the urban part of the suburban railway (between Piraeus, Magoula and Koropi stations, excluding the airport). The prices below include airport transfer. For more information visit https://www.athenstransport.com/english/tickets/. Join our Athens Instagram Photo Tour and get to know the most ‘photogenic’ spots of the city! Getting to the city center from Athens airport is relatively easy, but can be considered expensive by some travelers. The International Airport of Athens Eleftherios Venizelos is located in the region of Spata, 30 km from the center of Athens. It receives many domestic and international flights and it has regular transportation to the center of Athens, the port of Piraeus and the port of Rafina 24 hours a day/7 days a week. Once you arrive to the Athens airport, getting to the center is easy! Tip: We recommend buying a 3 day tourist pass which includes round-trip airport transit plus local Metro. Take Metro Line 3 (the blue line) which connects the Athens airport to Syntagma, the center of Athens. On the same line you can go to Monastiraki station and from there you can take Line 1 (the green line) to Piraeus. Four local buses operate at the airport; dropping passengers off at departures and picking up passengers at arrivals between exits 2 and 3. While a bus may not be the most convenient because of its longer duration, it operates around the clock and is an affordable option. Departing every 15-25 minutes, you can take the Suburban Railway (Proastiakos) from the Athens Airport railway station to Plakentias station, where you can change trains and continue to the city center (blue line) using the same ticket. Alternatively, you can continue straight to the city center until Larissa metro station (red line), a route introduced in 2017. While Uber was suspended in Greece in 2018, taxis are available 24/7. Taking a taxi is significantly more expensive than public transit, but they are also the fastest and most convenient option. If you’re traveling with a lot of bags, it's probably worth it to avoid the hassle. Find your taxi at the designated taxi waiting area at Exit 3 of Arrivals Level. Tip: Download “Beat”, a local app that is used to easily hail a taxi! Check out the special infographic we have created for this post and feel free to pin it! Have you been to Athens? Did you have trouble in navigating and what was your favorite way of getting around? Share your thoughts in the comments below!